Home » Get ready – the Ford 1 liter EcoBoost is coming! Get ready – the Ford 1 liter EcoBoost is coming! Get ready for the next step in the EcoBoost revolution: this time a 1 liter 3 cylinder direct-injected turbocharged engine. It’s already rolling out in cars across Ford of Europe, and it’s coming to North America next year in a Fiesta. And if you think it’s not of interest to performance enthusiasts, consider that in a Formula Ford chassis it set records on the Nurburgring circuit over the summer. That car did so well that Ford is even considering building a run of them for a race series. This is the same technology that is providing fuel economy and performance benefits in sizes ranging from 1 liters to 3.5… and perhaps one day even 5 liters. And regardless of engine size, every example is a fun to drive engine with surprising dynamics. Brentwood, Essex, 15 October 2012 – Ford will this month offer C-MAX and Grand C-MAX with the acclaimed1.0-litre EcoBoost petrol engine – a combination which delivers best-in-class fuel efficiency and CO2 emissions. The Ford C-MAX 1.0-litre EcoBoost delivers 55.4mpg and 117g/km CO2 across both power outputs, while the Grand C-MAX achieves 54.3mpg and 119g/km CO2. Ford has sold more than 27,000 C-MAX and Grand C-MAX cars in Britain since the latest versions were introduced in 2010; with the two models this year claiming Ford’s largest share of the compact multi-activity vehicle segment since the original C-MAX went on sale in 2003. The three-cylinder 1.0-litre EcoBoost petrol engine uses turbocharging, direct fuel injection and variable valve timing on both intake and exhaust to deliver the power of a larger engine with the fuel efficiency of a downsized unit. Over 7,500 customers in Britain have ordered a Focus 1.0-litre EcoBoost since launch, with the new engine making up around 25 per cent of total orders. 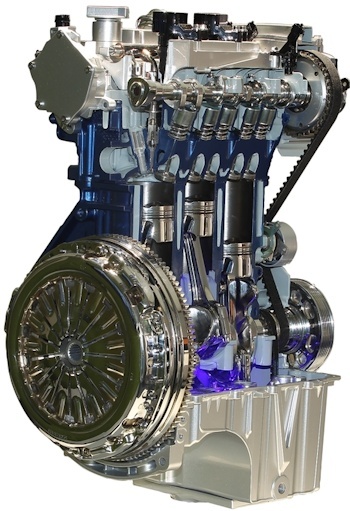 Ford predicts that by 2015 more than half of the vehicles it produces for Europe will be powered by EcoBoost engines – which are also available in 1.6 and 2.0-litre displacements. To coincide with the introduction of the 1.0-litre powertrain, a Titanium X series joins the C-MAX and Grand C-MAX ranges. Standard features include a panoramic roof, xenon headlamps with jet wash, partial leather seats, heated front seats, power driver seat, new style 17in alloy wheels and, in the five-seat C-MAX, a comfort rear seat system. This seating system offers the convenience of configurable rear seating to provide additional rear space and leg room. The updated C-MAX and Grand C-MAX also offer the in-car connectivity system SYNC with Emergency Assistance; and optional advanced driver assistance technologies Active City Stop, Lane Keeping Aid, Lane Departure Warning, Auto High Beam, Driver Alert and Traffic Sign Recognition. Customers will also be able to specify Blind Spot Information System (BLIS) and Power Tailgate options and a stylish new colour, Burnished Glow. All Ford C-MAX and Grand C-MAX models for UK customers are produced in Ford’s Valencia Plant in Spain.